Antoine BAZINET 1650-1729 was born in Aquitaine, France and apparently arrived with his parents as settlers brought to New France by Jean TALON in the 1660's. Francoise JANOT 1658-1793 was born in the New World. Antoine and Francoise were marrind in Ville Marie (Montreal) in 1675. Antoine and Francoise's gggg-grandson Damase BAZINET 1833-1879 married Victoria DUBEAU 1842-1922 in Sainte-Mélanie, Joliette, Quebec on July 27, 1858. Two children were born to them in Quebec before they decided to move to Simcoe County, Ontario in 1863. They settled in Lafontaine, Tiny Township where they had another seven children before relocating the family to Penetanguishene in 1873 where the last three in their family were born. 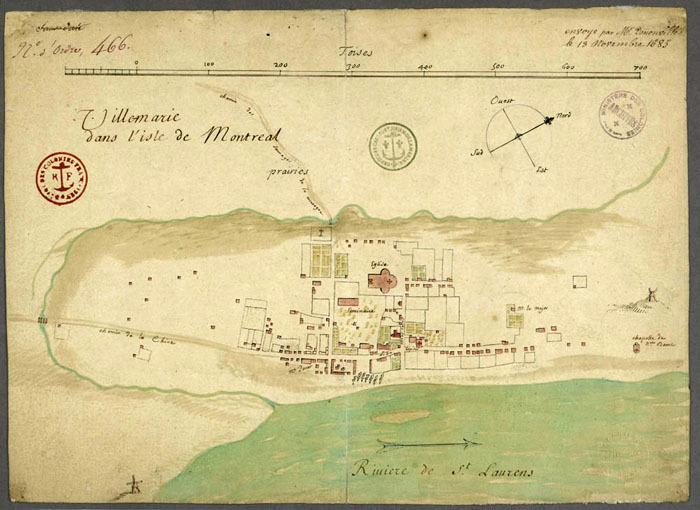 Map of Ville Marie on the Island of Montreal, November 1685.